What a neat idea! We're about to start a bathroom remodel, so we'll have a few of these sitting around, I'm sure. FABULOUS....love this and your boxes look soooooo coooool!! This is such a wonderful idea! What fun. Thanks. Yes! I love these boxes, I learned how to make something similar out of old greeting cards, but I these are even better!! Who would have ever thought? So cool! Thank You for this tutorial! I KNEW there had to be something that I could do with all of those swatches that I have saved! LOVE!! I used to always collect paint chips when I was a kid b/c I just loved the colors. Now I can actually do something with them! I love them too. You have wonderful ideas! Thanks. Courtney: "Aww, CUTE! I like them! Is Auntie Jess gonna send us some?" She didn't say that. Did she? Courtney: "Okay. So is she gonna send us some?" We're painting, BTW. Being artistic like Auntie Jess (my words). What a great idea! I would never have thought of that, but I can think of so many places where they'd be cute and useful. Thanks. Mum, uh, give her the classic grown-up answer: we'll see. How fun. 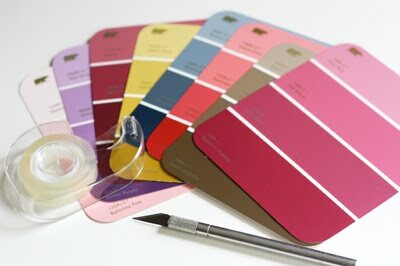 I have so many of these paint sample cards. Great project. I used to make similar boxes out of old Christmas cards, using the front of the card as a lid that covered the whole bottom box, which was the back undecorated half of the card. I didn't use any tape to hold them at all. I just cut them to have a little extra to fold over the flappy bits and friction kept them from unfolding. Can I just say you are genious! Love them. Love this idea! The colours looks so great. I had a strange dream last night that I was running all over town desperately trying to find a small box to package a tiny gift in, to no avail, and though I had forgotten the dream, when I clicked on your blog I went "OH I CAN JUST MAKE SOME" as it flooded vividly back. Brilliant! Cannot wait to make these...just as soon as I find where I stashed all those paint swatches. Adorable! I love how they have the stripes on them. I agree with the person who said that this would make an adorable engagement ring box. Now I want to go to the hardware store and swipe paint samples! How fun! Such a great idea! Thanks. 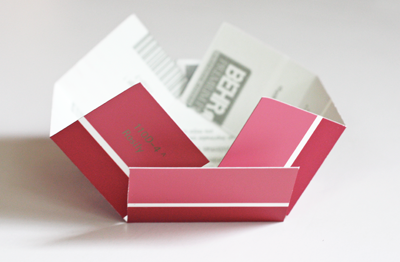 These are gorgeous - I've made little books out of paint swatches, but this wins! These are charming and your tutorial photos are probably the best I've ever seen... terrific job!!! This is freakin awesome! I just found you from Be Different Act Normal and I need to go nose around at your crafty ideas now! I am totally doing this and pinning it to my craft board! great idea! will have to try it out! thanks! That is the cutest thing I have seen in a long time! Thanks for sharing! Love this! Such an awesome idea! Great idea! Perfect for all my old paint swatches! 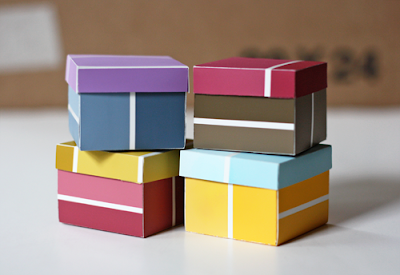 Wonderful, thanks for the project, they'd make such unusual little gift boxes and could be coordinated to the gift inside. This is the coolest thing.....I always feel bad throwing those swatch cards out - now I don't have to! Fantasically brilliant - love it! Useful idea. Thank you for sharing. A great project for the kids this summer - field trip to paint store and then home to make these! I'm obsessed with any craft that involves paper! Maybe it's the paperateer in me. I totally just made up that word. This is fun, pretty and useful! 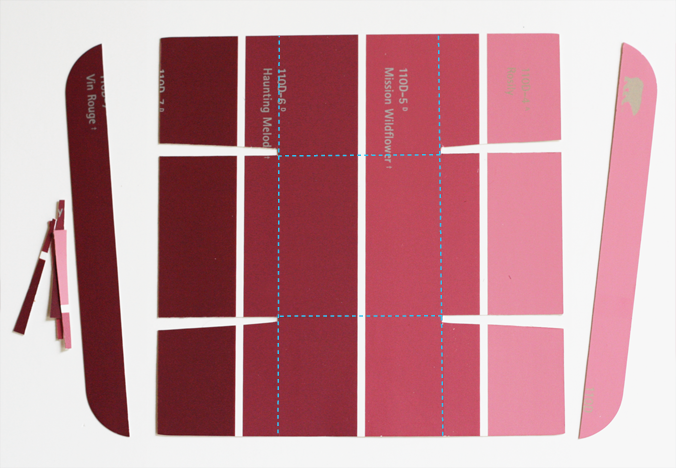 Also obsessed with paint chips. Wonderful idea for little gifts. Made one tonight and realize how cute these would be with small bows on a Christmas tree. Going to make a lot more. Great idea for free ornaments! Love these!! I am a pre school teacher and we have TONS of these and this will be perfect! Thank You for the great idea can't wait to make some!!! I love your blog! And this idea is really unique. Brilliant! The boxes are really neat! Cute! Can't wait to make these. Thanks! Imaginative and Innovative Idea! Thank You! what a colorful and clever idea. I'm really excited to try this one out! Thanks for the inspiration. so lovely, will surely try them out! very cute .. i've also seen where someone made book marks out of the swatches by dazzling it up .. i work in a dept store that has a paint dept and had i thought last year when the old colors went out i would have brought home the three cases of swatches that got thrown away oh well there's always next time huh ..
Bummer, My Behr paint swatches are 5x6 before cutting off the 1/2 inches on the rounded edges. How old are you samples? Mine are a month old. Maybe they've changed sizes. Fun idea, though. At the time I wrote this post, my swatches were maybe a month old. If your cards are 5x6, you can lose a half inch on each end and the result is a 5x5 square, right? I made the box following your instructions and the lids falls down into the bottom. It seems to me the lid will need to be bigger than a 5x5 to start becasue it will need to fit over the bottom. Would have beeen a great idea if it had worked. Actually the lid is made from a 3x3 square. 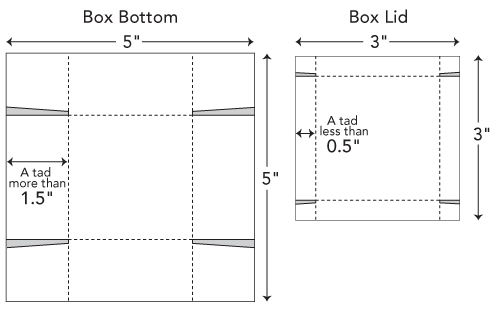 If you start with a 5x5 square for the bottom of the box, making the sides slightly taller than 1.5" results in a box bottom that is just a hair UNDER 2" wide. 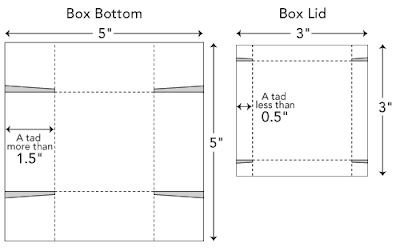 Making the sides of the lid slightly shorter than 0.5" results in a lid that is a hair OVER 2" wide. So the lid should fit over the bottom of the box without falling in. Super cute. I just posted it on Pinterest (crediting you and redirecting to your website of course!) and I got 30 repins in literally 2 minutes. Great work! Really great idea! Hope the folks at the local HW store don't see it - because I am heading that way! 2 cute! color combos are endless. I just made one today... so cute! The link isn't working. I tried going to www.Moonkids.nl but that isn't working, either. I'm interested to see what you've created! Ash. Hi Ash, what link are you referring to? I'm not sure if you want or can do anything about it, but I thought you might like to know. Yeah, someone brought that to my attention the other day. I quickly found other posts of mine that have been lifted (no text, just all the step-by-step photos, which now have Duitang watermarks on them and some Chinese text.) And no credit or link anywhere that I could see, so it's annoying, alright. But I don't know what I can do about it. Hi Jessica. I'm glad you were notified. It is frustrating though that there doesn't seem to be much action you can take stop content being lifted (aside from not posting). I guess you could place watermarks of your own over your images but I'm guessing you might find that unsightly. Waaaay cool. My sister sent me the link because she knows I have boxes of paint samples. I use them to make small weavings for greeting cards, but had never thought of this. Thanks so much for sharing! such an awesome idea!!! Thank you so much for sharing the tutorial.. These are awesome! 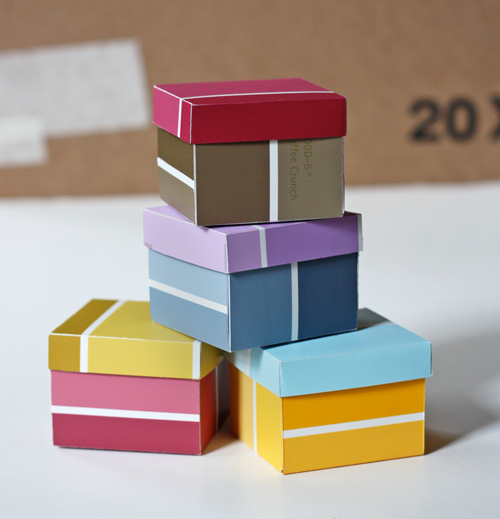 Making some as candy favor boxes for my wedding, and they look wonderful. One thing I found easier to do is to use tiny glue dots (3/16") in place of the double sided tape.....you can directly press them onto the paint chips and keep your fingers sticky-free. Thanks for a cool project idea!